There are many challenges to running a business. However, the upside, the one you value most, is that you get to be in charge. The product is your brainchild. How and when it hits the market is also up to you. Whom you hire is also your decision. You have just enough resources to hire the best and the brightest, provided you contain your operating expenses. Your resources and your time are your most value assets. Yet, every year, they are being consumed by the growing complexities of HR administration. What you can do is take action to contain the overall costs of HR. 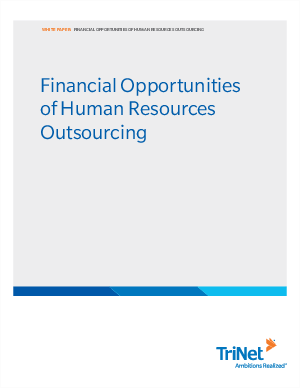 Outsourcing human resources to a Professional Employer Organization (PEO) has been the most effective way for thousands of companies across the U.S. to continually provide high-quality HR services while saving time and protecting their bottom line over the lifespan of their business.